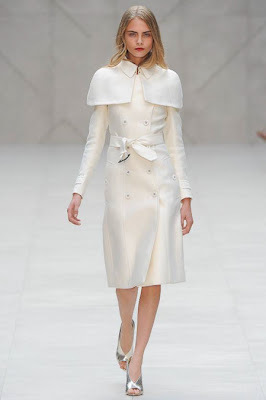 Christopher Bailey did it again, I must say. If someone asked me a word to describe this collection,that had "Corset and Capes" has a theme, I would say unhesitatingly: sophistication. Mr. 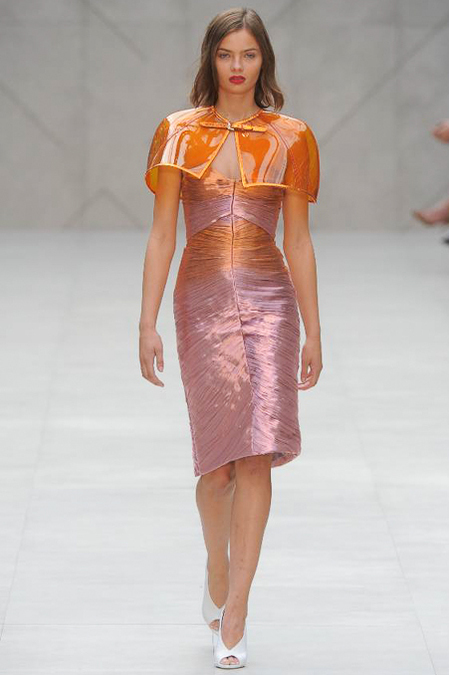 Bailed said that he wanted to communicate "a very British glamour" and the 40s served as inspiration. In my opinion, it was thrilling to see the game between the colors, shines and shapes. Highlight: the lady hand bags. Looked really stunning. Christopher Bailey apresentou novamente uma coleção entusiasmante e inovadora, na minha opinião. Se me pedissem uma palavra para descrever a mesma, usaria talvez a palavra sofisticação. E foi mesmo isso que o designer imprimiu em todas as peças desta coleção, que teve como tema "Corpetes e Capas". Bailed referiu que com estas peças procurou transmitir um retorno ao glamour britânico, tendo-se inspirado maioritariamente nos anos 40. Muito interessante observar o jogo entre as cores, os brilhos e as formas estruturadas. Highlight: as carteiras de senhora exalavam bom gosto.